This chapter discusses the Green ICT approach of an Australian Rules football club. In the role of their IT Manager, I had the opportunity to undertake formal training and then formulate an approach to uplifting the club’s environmental credentials. This chapter is all about understanding the ICT equipment’s contribution to the overall emissions of the respective clubs and the industry as a whole. As a case study, this chapter starts with how the football industry is addressing the efforts to reduce carbon emissions, considers the potential for IT to be a low-carbon enabler and then applies it to a specific football club. A Green ICT Audit undertaken by the Australian Computer Society (ACS) in August 2007 found that the amount of carbon emissions attributable to ICT usage by Australian businesses was approximately 8 million tonnes CO2 per annum, or 1.54% of the total emissions from total energy consumed2. While ICT’s contribution to annual emissions might appear minute, the audit concluded that it still represents an opportunity for ICT to contribute to overall reduction schemes. 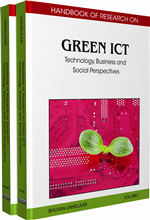 It recognises the potential for ICT to be a low-carbon enabler. Where Is The Afl And Its Clubs With Green Ict?